These interactive Apraxia Activity packets are a creative and engaging way to elicit multiple repetitions of targets in speech and language therapy. Designed for children with apraxia or severe articulation needs who are working at CV / VC / CVC level. 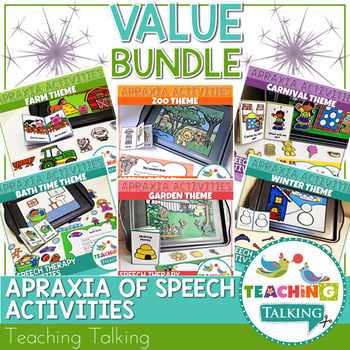 This apraxia value bundle contains six packets (Farm, Carnival, Garden, Winter Snow, Zoo and Bath Time Themes). ★ "Power cards" - Engaging illustrations of the most powerful words and phrases in each set. Use these cards to carry over learning and meaning for your students from therapy into everyday communication. All activities are included in both color and blackline version to save on color ink if required. Your students will have so much fun as they play and interact with the characters! They practice multiple repetitions of target words in a play based context. 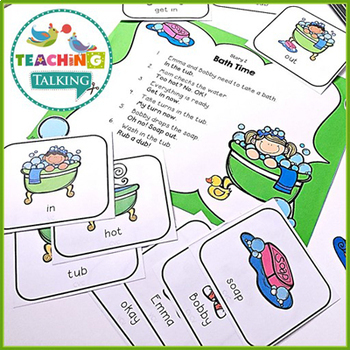 The mini books and drill sheets mean you can use this activity with groups and / or centers and you have resources at your fingertips to send for home practice. All packets in the range are suitable for highly unintelligible students and elicit multiple repetitions of target words. They are progressive and students will benefit from therapy using the packet that most closely aligns with their goals. 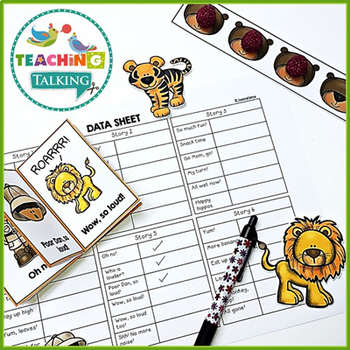 - Includes story elements to encourage varied prosody throughout.